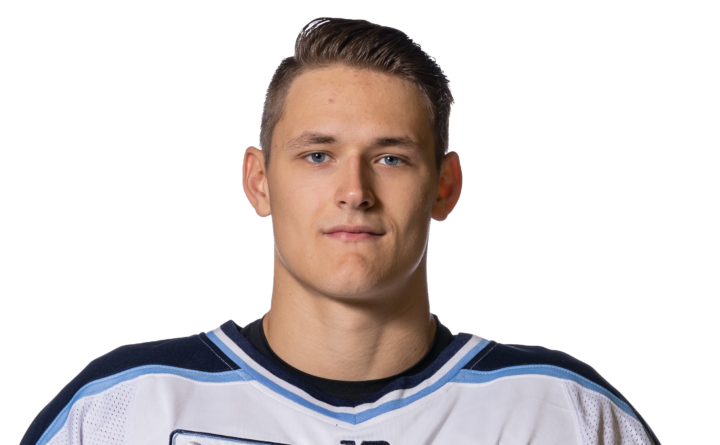 Afters scoring just one goal in his first 13 games, University of Maine sophomore right wing Eduards Tralmaks notched his third over the last five games on Monday night and it was one of the most important ones of his young career. He scored with just 48 seconds left in overtime to give the Black Bears a 4-3 victory over Yale in a non-conference hockey game at the Cross Insurance Arena in Portland. UMaine improved to 7-9-2 while ECAC co-leader Yale, ranked 19th in Monday’s U.S. College Hockey Online poll, fell to 7-5-3. The Black Bears remained undefeated in overtime, going 2-0-2 in their four overtime games. “I haven’t put a puck in the net in overtime in a long time,” said Tralmaks, who had 11 goals and 14 assists in 37 games a year ago to lead the UMaine freshmen and tie for third on the team in points. He added that it’s nice to start scoring goals again and credited linemates Chase Pearson and Mitch Fossier with their roles in his resurgence which includes points in four of his last five games (3 goals, 1 assist). “I love playing with them. We have a really good connection right now. If we keep working, there will be more good things to come out of our line,” Tralmaks said. Junior center and co-captain Pearson had a goal and an assist and junior left wing Fossier had three assists. Tralmaks’ goal came off a “great move” UMaine head coach Red Gendron said. “Brady Keeper fed him the puck, a defenseman came at him but he toasted him one-on-one, walked in and wired a shot,” Gendron said. “Brady gave me a great pass. I made a head fake that I make every day, I beat the guy and closed my eyes and shot,” said Tralmaks, who put the puck past Yale goalie Sam Tucker from the faceoff circle. “He made a very nice play,” said Fossier, who assisted on the goal along with Keeper. The Black Bears spotted Yale the game-opening goal by Evan Smith on a breakaway before taking a 3-1 lead on first-period goals 4:14 apart by Pearson and Rob Michel and a second-period goal by Emil Westerlund. Pearson converted a pass from Fossier on the power play to extend his goal-scoring streak to three games; Michel scored on a shot from the point to end a 13-game goalless drought and Westerlund snapped a 12-game pointless streak with a goal off assists from Ryan Smith and Sam Becker. Michel also picked up an assist on Pearson’s goal. But Yale’s Andrew Gaus and Mitchell Smith answered with unassisted second-period goals 5:12 apart to tie it up as Gaus capitalized on a UMaine turnover and Smith scored off a rush after UMaine had a glittering chance at the other end. Both teams hit the post in overtime before Tralmaks scored his game-winner. Jeremy Swayman finished with 32 saves for the Black Bears, while Tucker wound up with 36. Yale was without defensemen Jack St. Ivany and Phil Kemp, who earned a silver medal playing for the United States in the World Junior championships in Vancouver. Yale went 0-for-5 on the power play and UMaine has now killed off 23 of the opponents’ last 25 chances. UMaine went 1-for-3 with the man advantage but two of them were abbreviated, lasting just 31 and 36 seconds, because the Bulldogs took penalties shortly after they went on the power play. UMaine finished its non-conference schedule with a 4-6 record and will begin its stretch of 16 Hockey East games with a weekend home series against Northeastern University at 7:30 p.m. Friday and 7 p.m. Saturday.